Corrosion is deterioration of essential properties in a material due to reactions with its environment. It is the loss of an electron of metals reacting with water or oxygen. Weakening of iron due to oxidation of the iron atoms is a well-known example of electrochemistry (a branch of chemistry that studies the reactions that take place when an ionic and electronic conductor interfere) corrosion. This is commonly known as rust. This type of damage usually affects metallic materials, and typically produces oxide(s) and/or salt(s) of the original metal. Corrosion also includes the dissolution of ceramic materials and can refer to discoloration and weakening of polymers by the sun's ultraviolet light. Most structural alloys corrode merely from exposure to moisture in the air, but the process can be strongly affected by exposure to certain substances (see below). Corrosion can be concentrated locally to form a pit or crack, or it can extend across a wide area to produce general deterioration. While some efforts to reduce corrosion merely redirect the damage into less visible, less predictable forms, controlled corrosion treatments such as passivation and chromate-conversion will increase a material's corrosion resistance. Rust, the most familiar example of corrosion. Most ceramic materials are almost entirely immune to corrosion. The strong ionic and/or covalent bonds that hold them together leave very little free chemical energy in the structure; they can be thought of as already corroded. When corrosion does occur, it is almost always a simple dissolution of the material or chemical reaction, rather than an electrochemical process. A common example of corrosion protection in ceramics is the lime added to soda-lime glass to reduce its solubility in water; though it is not nearly as soluble as pure sodium silicate, normal glass does form sub-microscopic flaws when exposed to moisture. Due to its brittleness, such flaws cause a dramatic reduction in the strength of a glass object during its first few hours at room temperature. The degradation of polymeric materials is due to a wide array of complex and often poorly-understood physiochemical processes. These are strikingly different from the other processes discussed here, and so the term "corrosion" is only applied to them in a loose sense of the word. Because of their large molecular weight, very little entropy can be gained by mixing a given mass of polymer with another substance, making them generally quite difficult to dissolve. While dissolution is a problem in some polymer applications, it is relatively simple to design against. A more common and related problem is swelling, where small molecules infiltrate the structure, reducing strength and stiffness and causing a volume change. Conversely, many polymers (notably flexible vinyl) are intentionally swelled with plasticizers, which can be leached out of the structure, causing brittleness or other undesirable changes. The most common form of degradation, however, is a decrease in polymer chain length. Mechanisms which break polymer chains are familiar to biologists because of their effect on DNA: ionizing radiation (most commonly ultraviolet light), free radicals, and oxidizers such as oxygen, ozone, and chlorine. Additives can slow these process very effectively, and can be as simple as a UV-absorbing pigment (i.e., titanium dioxide or carbon black). Plastic shopping bags often do not include these additives so that they break down more easily as litter. The remainder of this article is about electrochemical corrosion. One way to understand the structure of metals on the basis of particles is to imagine an array of positively-charged ions sitting in a negatively-charged " gas" of free electrons. Coulombic attraction holds these oppositely-charged particles together, but there are other sorts of negative charge which are also attracted to the metal ions, such as the negative ions ( anions) in an electrolyte. For a given ion at the surface of a metal, there is a certain amount of energy to be gained or lost by dissolving into the electrolyte or becoming a part of the metal, which reflects an atom-scale tug-of-war between the electron gas and dissolved anions. The quantity of energy then strongly depends on a host of variables, including the types of ions in a solution and their concentrations, and the number of electrons present at the metal's surface. In turn, corrosion processes cause electrochemical changes, meaning that they strongly affect all of these variables. The overall interaction between electrons and ions tends to produce a state of local thermodynamic equilibrium that can often be described using basic chemistry and a knowledge of initial conditions. Some metals are more intrinsically resistant to corrosion than others, either due to the fundamental nature of the electrochemical processes involved or due to the details of how reaction products form. For some examples, see galvanic series. If a more susceptible material is used, many techniques can be applied during an item's manufacture and use to protect its materials from damage. Gold nuggets do not corrode, even on a geological time scale. The materials most resistant to corrosion are those for which corrosion is thermodynamically unfavorable. Any corrosion products of gold or platinum tend to decompose spontaneously into pure metal, which is why these elements can be found in metallic form on Earth, and is a large part of their intrinsic value. More common "base" metals can only be protected by more temporary means. Some metals have naturally slow reaction kinetics, even though their corrosion is thermodynamically favorable. These include such metals as zinc, magnesium, and cadmium. While corrosion of these metals is continuous and ongoing, it happens at an acceptably slow rate. An extreme example is graphite, which releases large amounts of energy upon oxidation, but has such slow kinetics that it is effectively immune to electrochemical corrosion under normal conditions. Given the right conditions, a thin film of corrosion products can form on a metal's surface spontaneously, acting as a barrier to further oxidation. When this layer stops growing at less than a micrometre thick under the conditions that a material will be used in, the phenomenon is known as passivation (rust, for example, usually grows to be much thicker, and so is not considered passivation, because this mixed oxidized layer is not protective). While this effect is in some sense a property of the material, it serves as an indirect kinetic barrier: the reaction is often quite rapid unless and until an impermiable layer forms. Passivation in air and water at moderate pH is seen in such materials as aluminium, stainless steel, titanium, and silicon. These conditions required for passivation are specific to the material. The effect of pH is recorded using Pourbaix diagrams, but many other factors are influential. Some conditions that inhibit passivation include: high pH for aluminium, low pH or the presence of chloride ions for stainless steel, high temperature for titanium (in which case the oxide dissolves into the metal, rather than the electrolyte) and fluoride ions for silicon. On the other hand, sometimes unusual conditions can bring on passivation in materials that are normally unprotected, as the alkaline environment of concrete does for steel rebar. Exposure to a liquid metal such as mercury or hot solder can often circumvent passivation mechanisms. Plating, painting, and the application of enamel are the most common anti-corrosion treatments. They work by providing a barrier of corrosion-resistant material between the damaging environment and the (often cheaper, tougher, and/or easier-to-process) structural material. Aside from cosmetic and manufacturing issues, there are tradeoffs in mechanical flexibility versus resistance to abrasion and high temperature. Platings usually fail only in small sections, and if the plating is more noble than the substrate (for example, chromium on steel), a galvanic couple will cause any exposed area to corrode much more rapidly than an unplated surface would. For this reason, it is often wise to plate with a more active metal such as zinc or cadmium. If the environment is controlled (especially in recirculating systems), corrosion inhibitors can often be added to it. These form an electrically insulating and/or chemically impermeable coating on exposed metal surfaces, to suppress electrochemical reactions. Such methods obviously make the system less sensitive to scratches or defects in the coating, since extra inhibitors can be made available wherever metal becomes exposed. Chemicals that inhibit corrosion include some of the salts in hard water (Roman water systems are famous for their mineral deposits), chromates, phosphates, and a wide range of specially-designed chemicals that resemble surfactants (i.e. long-chain organic molecules with ionic end groups). This figure-8 descender is annodized with a yellow finish. Climbing equipment is available in a wide range of anodized colors. Aluminium alloys often undergo a surface treatment. Electrochemical conditions in the bath are carefully adjusted so that uniform pores several nanometers wide appear in the metal's oxide film. These pores allow the oxide to grow much thicker than passivating conditions would allow. At the end of the treatment, the pores are allowed to seal, forming a harder-than-usual surface layer. If this coating is scratched, normal passivation processes take over to protect the damaged area. Cathodic protection (CP) is a technique to control the corrosion of a metal surface by making that surface the cathode of an electrochemical cell. It is a method used to protect metal structures from corrosion. Cathodic protection systems are most commonly used to protect steel, water, and fuel pipelines and tanks; steel pier piles, ships, and offshore oil platforms. For effective CP, the potential of the steel surface is polarized (pushed) more negative until the metal surface has a uniform potential. With a uniform potential, the driving force for the corrosion reaction is halted. For galvanic CP systems, the anode material corrodes under the influence of the steel, and eventually it must be replaced. The polarization is caused by the current flow from the anode to the cathode, driven by the difference in electrochemical potential between the anode and the cathode. For larger structures, galvanic anodes cannot economically deliver enough current to provide complete protection. Impressed Current Cathodic Protection (ICCP) systems use anodes connected to a DC power source (a cathodic protection rectifier). Anodes for ICCP systems are tubular and solid rod shapes of various specialized materials. These include high silicon cast iron, graphite, mixed metal oxide or platinum coated titanium or niobium coated rod and wires. Passivation is extremely useful in alleviating corrosion damage, but care must be taken not to trust it too thoroughly. Even a high-quality alloy will corrode if its ability to form a passivating film is compromised. Because the resulting modes of corrosion are more exotic and their immediate results are less visible than rust and other bulk corrosion, they often escape notice and cause problems among those who are not familiar with them. Certain conditions, such as low availability of oxygen or high concentrations of species such as chloride which compete as anions, can interfere with a given alloy's ability to re-form a passivating film. In the worst case, almost all of the surface will remain protected, but tiny local fluctuations will degrade the oxide film in a few critical points. Corrosion at these points will be greatly amplified, and can cause corrosion pits of several types, depending upon conditions. While the corrosion pits only nucleate under fairly extreme circumstances, they can continue to grow even when conditions return to normal, since the interior of a pit is naturally deprived of oxygen. In extreme cases, the sharp tips of extremely long and narrow pits can cause stress concentration to the point that otherwise tough alloys can shatter, or a thin film pierced by an invisibly small hole can hide a thumb sized pit from view. These problems are especially dangerous because they are difficult to detect before a part or structure fails. Pitting remains among the most common and damaging forms of corrosion in passivated alloys, but it can be prevented by control of the alloy's environment, which often includes ensuring that the material is exposed to oxygen uniformly (i.e., eliminating crevices). Many useful passivating oxides are also effective abrasives, particularly TiO2 and Al2O3. Fretting corrosion occurs when particles of corrosion product continuously abrade away the passivating film as two metal surfaces are rubbed together. While this process does often damage the frets of musical instruments, they were named separately. Stainless steel can pose special corrosion challenges, since its passivating behaviour relies on the presence of a minor alloying component (Chromium, typically only 18%). Due to the elevated temperatures of welding or during improper heat treatment, chromium carbides can form in the grain boundaries of stainless alloys. 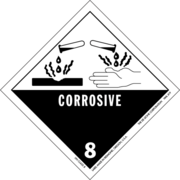 This chemical reaction robs the material of chromium in the zone near the grain boundary, making those areas much less resistant to corrosion. This creates a galvanic couple with the well-protected alloy nearby, which leads to weld decay (corrosion of the grain boundaries near welds) in highly corrosive environments. Special alloys, either with low carbon content or with added carbon " getters" such as titanium and niobium (in types 321 and 347, respectively), can prevent this effect, but the latter require special heat treatment after welding to prevent the similar phenomenon of knifeline attack. As its name applies, this is limited to a small zone, often only a few micrometres across, which causes it to proceed more rapidly. This zone is very near the weld, making it even less noticeable1. Microbial corrosion, or bacterial corrosion, is a corrosion caused or promoted by microorganisms, usually chemoautotrophs. It can apply to both metals and non-metallic materials, in both the presence and lack of oxygen. Sulfate-reducing bacteria are common in lack of oxygen; they produce hydrogen sulfide, causing sulfide stress cracking. In presence of oxygen, some bacteria directly oxidize iron to iron oxides and hydroxides, other bacteria oxidize sulfur and produce sulfuric acid. Concentration cells can form in the deposits of corrosion products, causing and enhancing galvanic corrosion. High temperature corrosion is chemical deterioration of a material (typically a metal) under very high temperature conditions. This non-galvanic form of corrosion can occur when a metal is subject to a high temperature atmosphere containing oxygen, sulphur or other compounds capable of oxidising (or assisting the oxidation of) the material concerned. For example, materials used in aerospace, power generation and even in car engines have to resist sustained periods at high temperature in which they may be exposed to an atmosphere containing potentially highly corrosive products of combustion. The products of high temperature corrosion can potentially be turned to the advantage of the engineer. The formation of oxides on stainless steels, for example, can provide a protective layer preventing further atmospheric attack, allowing for a material to be used for sustained periods at both room and high temperature in hostile conditions. Such high temperature corrosion products in the form of compacted oxide layer glazes have also been shown to prevent or reduce wear during high temperature sliding contact of metallic (or metallic and ceramic) surfaces. The US Federal Highway Administration released a study, entitled Corrosion Costs and Preventive Strategies in the United States, in 2002 on the direct costs associated with metallic corrosion in nearly every U.S. industry sector. The study showed that for 1998 the total annual estimated direct cost of corrosion in the U.S. was approximately $276 billion (approximately 3.1% of the US gross domestic product). FHWA Report Number:FHWA-RD-01-156. The NACE International website has a summary slideshow of the report findings. Jones1 writes that electrochemical corrosion causes between $8 billion and $128 billion in economic damage per year in the United States alone, degrading structures, machines, and containers.